The sketches from the Adelphi drama show, at the top, the hero, Walter Lee (Mr. Warner) escaping after the explosion which has blown down the walls of (Clerkenwell prison, where he is detained on that false charge which invariably awaits the heroes of sensation dramas; and below he is represented escaping again on the back of a Derby favourite from the training stable, where his persecutors have run him down. 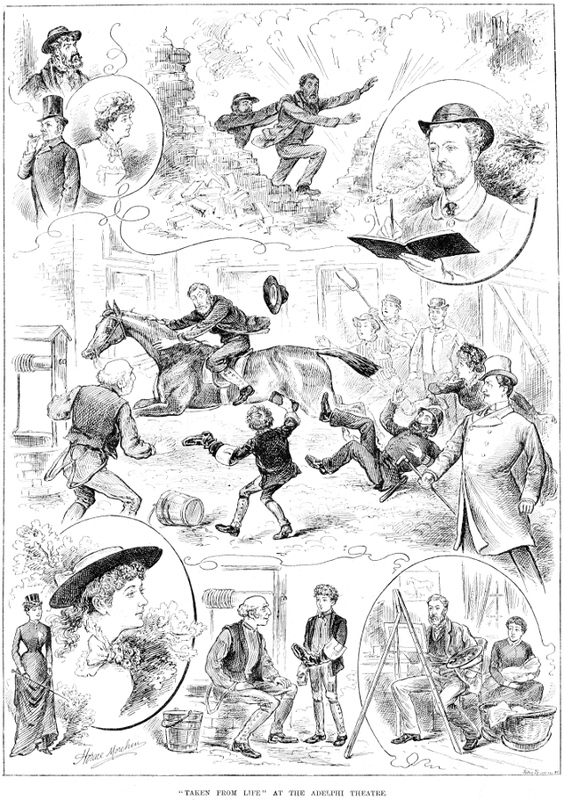 Sketches of Mr. E. H. Brooke as the socialist, and of Mr. F. Thorne as a nondescript, finally "Titus the Tipster," are in the left hand top corner. Below, is the interview between the groom and stable-boy (Mr. Proctor and Miss Rogers), as also the interior of the wretched lodging, to which Lee, who does not behave as well in this particular as the hero of a melodrama should behave, has taken his wife Kate (Miss Gerard).